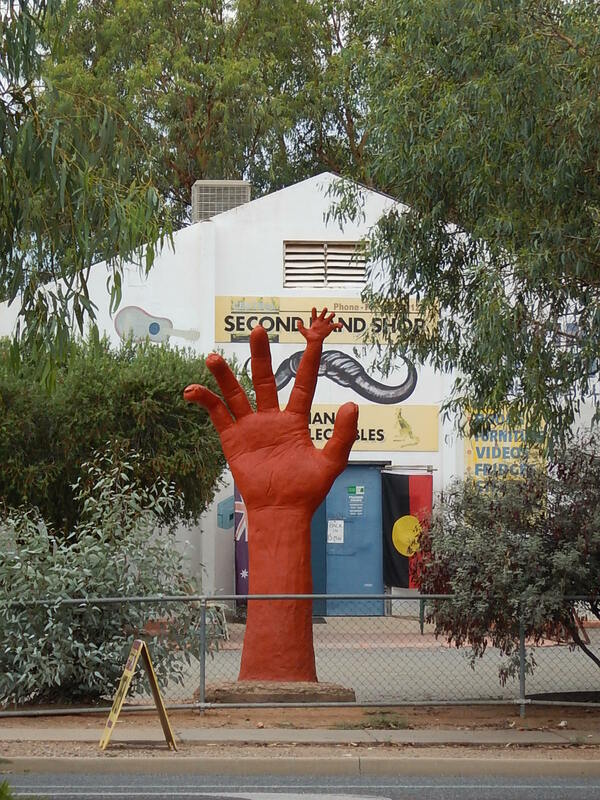 We spent the last few days in the centre of Australia in Alice Springs; we had no excursions booked and decided to visit some of the sites and services the town is famous for. On our first morning we walked, slowly, into town along the bank of the Todd River; it was very odd to see the bone-dry river bed flanked by flood markers showing depths up to 2 meters. We found the tourist information Office and asked for advice on key sites and local transport, it turned out that most of the things we wanted to see were outside of town and there was no public transport. The very helpful lady in the tourist office said some people ‘enjoy’ walking 4km out to the to The Telegraph station (it was 42⁰C) but she suggested we get a cab – good advice. We formulated a plan for the two days we had in town and went to find a cold drink to celebrate. The Royal Flying Doctor Service is based in town so we walked across town to visit their base. This famous service provides routine and emergency medical support to people living in remote areas across central Australia, there are several similar services in other parts of Australia but this was the first. The visitor centre provided a film explaining the history of the service and the cabin section of one of the plains kitted out so visitors can climb on-board and see how much equipment is squeezed into a small space. The planes are designed to land and take off on roads which means they can get fairly close to most communities in the outback and can respond to traffic accidents. They are basically flying intensive care units, the RFDS has over 60 planes in service, an electronic map in reception showed where they were all deployed, updating every 90 seconds. A small museum told the story of the RFDS which was established in 1928 following a campaign by the Rev John Flynn. There were also exhibits which told some of the stories of medical emergencies in the bush before the service began, in one case it took 12 days for a doctor to reach an injured stockman, he was too late. It is an amazing service and it was very interesting to find out more about it. On day two we took a taxi out to the Telegraph Station, one of the reasons the town exists. We had read a book called The Singing Line before we left home; it told the story of a project in the 1870’s led by Englishman Charles Todd to build a telegraph line linking Adelaide and Darwin, 3000 miles across the centre of Australia. He completed the work in two years and, by connecting the line to an undersea cable to Indonesia, he enabled communication with England in hours rather than weeks. Along the telegraph line he established a series of repeater stations where the signal could be boosted, one of these was named Alice Springs after his wife Alice and was the foundation of the town. The Telegraph station had fallen in to disrepair but has been restored to its state in 1899-1908, known as the Bradshaw Era after the 5th Station Manager Thomas Bradshaw; I was intrigued by this, my mums maiden name is Bradshaw so maybe there is some connection! Touring the station we saw the range of stone buildings which served as the offices and homes for the telegraph operators who manned the station, they received stores once a year by camel train other than that they had to be self-sufficient in this harsh environment. Thomas Bradshaw had four children when he arrived at Alice Springs and three more were born there during his time in office. From the Telegraph Station we took another cab to visit the School of the Air, another unique outback service that provides education to primary and early secondary age children in remote communities and on cattle stations. The original service was founded by the Rev Flynn (see above re the flying doctors!) in 1951 and relied on one way radios and a postal service that took two weeks to reach the students (the postal service carried on until quite recently). Now the students rely on computers which allow them to talk directly to their teachers and class mates. Four times a year the students (140 at the moment) meet up in Alice Springs for a one week activity, earlier this month they had swimming week. It was amazing to see the amount of care and planning that goes into providing a quality educational experience for these very isolated children. As a teacher Mark could appreciate the very special challenges this school faces. Another great thing to see. On Wednesday we were booked to leave the centre and fly to Cairns in the tropical rain forest on the east coast. While we waited for our lift to the airport we harnessed the help of the duty manager at the hotel to try and book us in for Christmas Day lunch at the Doubletree Hotel in Darwin, it was our third attempt to book, we had tried directly and another member of staff at the Doubletree Alice Springs had tried without success, it all felt a bit like Fawlty Towers but we will persevere. Will you have turkey and Christmas pud I wonder? Cheers chums, as promised, we raised a glass (or 2) in your honour, quite a warm Christmas here too.